The Beaufort, Raglan01291 690412work01291 690935fax InnEnjoy a blend of history and modernity in this 4 star inn now noted for its excellent Spanish-influenced restaurant and impressive wine list. Relax on the terrace, sip a real ale by the fire in the cosy bar, do business in the ample conference facilities, or overnight in their boutique rooms then savour their legendary breakfast. The bedrooms are all ensuite and in the main hotel they echo the rich history of the building and are decorated in sumptuous medieval colours, whilst the slightly smaller rooms in the Coach House building are decorated in a light and fresh "New England" style. A family suite and a family studio are also available offering more flexibility, especially with children. Relax in crisp cotton sheets and snuggly duvets and then start your day with a delicious breakfast, choosing cereals, yoghurts and fruit from our buffet whilst waiting for your choice of a lighter breakfast or our full Welsh breakfast with local produce to be freshly prepared. 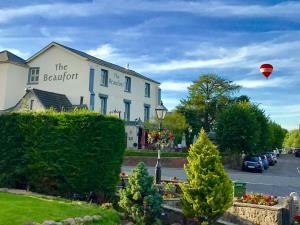 The Beaufort, Raglan has undergone a transformation since coming under new ownership in October 2015. The brasserie restaurant, lounge restaurant and Snug bar all offer excellent dining facilities, as does the terrace when the weather permits! The Beaufort really does offer a taste of the Mediterranean. Seafood is a speciality, which is beautifully displayed in the restaurant. A varied a la carte menu is available as are 2 course lunch and evening specials and a Sunday lunch special menu for a gorgeous roast. The team of chefs, lead by head chef Carlos, have worked hard to ensure that all starters and main courses are gluten free and some desserts are too. The team will do their best to cater for all dietary requirements. Enjoy a blend of history and modernity in this 4 star inn now noted for its excellent Spanish-influenced restaurant and impressive wine list. Bus stop opposite hotel, buses availble to Abergavenny/Monmouth/Newport and Usk. The nearest railway stations are at Abergavenny and Newport. We have a disabled public WC. Our ground floor bedrooms are only accessible via 2 or 3 steps and we are in the process of organising the amenities necessary in an ensuite.